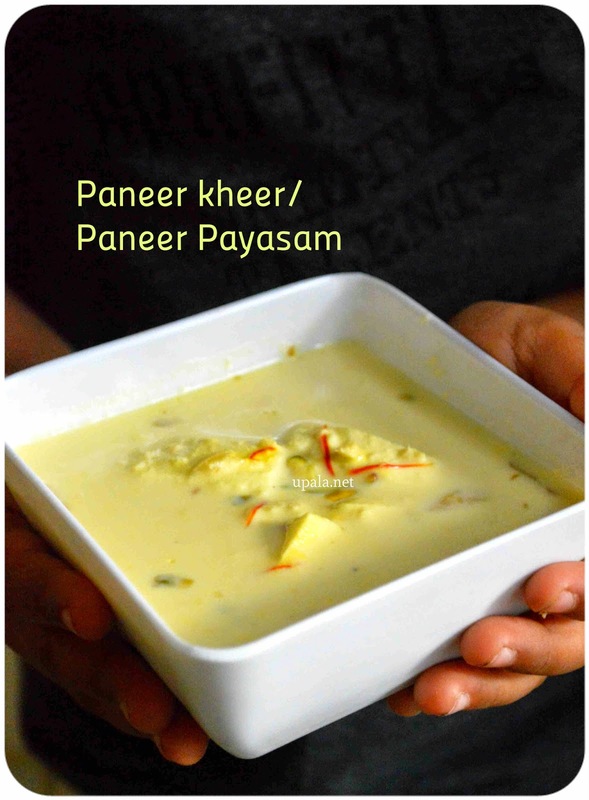 This Paneer kheer/Paneer payasam is a tasty kheer prepared by boiling thin paneer strips in Milk. We all loved this paneer payasam/Paneer kheer and I had only a bowl left to click pic for my blog but my little one grabed it to finish off. Finally I convinced him to pose for a photo with the kheer :). 1) Slice the paneer to thin vertical strips and keep aside. 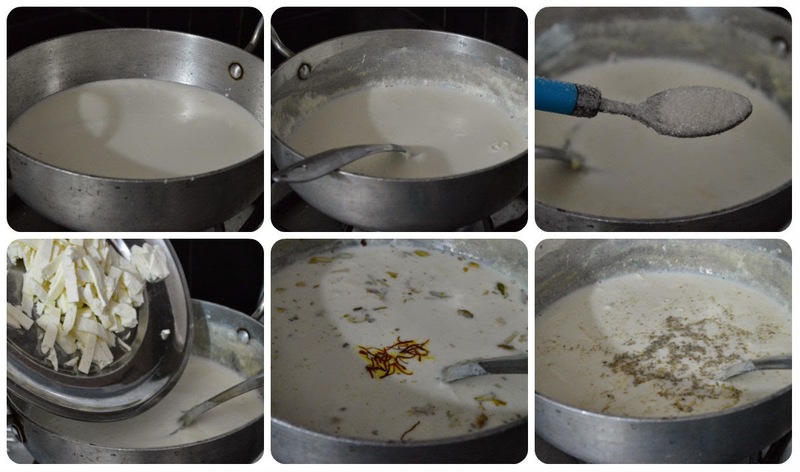 2) Boil milk in a kadai/heavy bottom pan till it reaches half of its quanity. 3) Add sugar and mix well. Next add paneer strips and leave it to boil for few minutes. Paneer needs to be cooked soft but should not turn mushy. 4) Add nuts and saffron, leave it to boil for 5 more minutes. 5) Finally add Cardamom powder and switch off the flame. Tasty paneer payasam/Paneer kheer is ready....Serve hot or chilled but do not forget to garnish with sliced Pista while serving. 1) Paneer can be chopped in any shape, here I have chopped as thin vertical strips, you can also chop as small thin squares or you can even grate or crumble the paneer according to your preference. 2) I prefer adding saffron directly to kheer, you can also soak them in 2 tbsp of warm milk and crush it well before adding. 3) Instead of adding Badam and pista, you can also fry cashews and raisins in ghee and add to get traditional payasam feel. 4) Have 1 cup of warm milk handy and if you think that this kheer has become thick add few milk to adjust.